We know more about the surface of Mars than the bottom of our oceans. Six times more humans have walked on the moon than explored the Mariana Trench, Earth’s deepest natural point. Equally alien, both hide unimaginable wonders, for now. 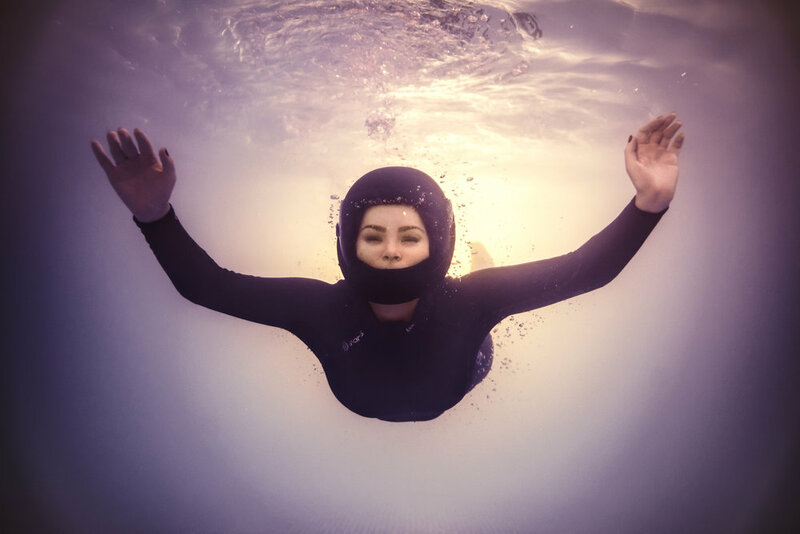 Veronika was the perfect model for our celestial, underwater skydiving test shoot. She’s one of those inspiring humans that make you stand back and evaluate what you’ve been doing with your life. An A&E doctor, scuba and skydiver, private pilot-student and POSSUM Scientist-Astronaut Candidate pursuing a career in space medicine, she’s who I would want in my exploration party. Model, makeup & styling - Dr Veronika P.
Along with all her skydiving gear, Veronika rocked up as a new expert in waterproof makeup. Invaluably, this meant we had more time in the pool than reapplying the look. We were spoilt for choice with outfits and gear, eventually settling on a futuristic-and-minimalist look for practicality and safety reasons. This didn’t stop trouble arising with the helmet, being more buoyant and difficult to manipulate in the water than expected. But that’s part of the fun and challenge of underwater photography - the unexpected. Modelling and photographing underwater is exhausting. Who knew holding your breath while trying to remain under the surface and pose, look, light and/or compose a photo well, would be so tiring? That’s why I search out pools with slides, hot tubs and a great pub lunch nearby. Highly recommended to keep everyone motivated! How it was shot. Yes, we’re really underwater. Our location. Of course the slide was used.